The evacuations have displaced about 2,000 people in the island’s southeast corner, including some members of Church of the Holy Apostles in Hilo, which is about a half-hour north of the evacuation zone. Of the six Episcopal congregations on Hawaii’s Big Island, Holy Apostles is closest to the volcano and its line of active fissures. The Diocese of Hawaii, based in Honolulu on Oahu, has been in regular contact with the Rev. Katlin McCallister, the priest-in-charge at Holy Apostles, as her congregation tends to members affected by the volcano and donates money and supplies to the broader disaster response. The church has pinned a list to the top of its Facebook page detailing the many ways Episcopalians can lend a hand. Despite the scale of the disaster and the continued threat it poses, McCallister has been encouraged by how people across the community have banded together, especially the interfaith coalition that includes Holy Apostles. Holy Apostles, with an annual Sunday attendance of about 120, draws members from across a large geographic area, and several members have been directly affected by the disaster. One family lost its home and farm to the lava flows. About five other member families have had to flee the evacuation zone. The spokeswoman for the mayor’s office also is a Holy Apostles member and has been working tirelessly since the eruptions started May 3, McCallister said. Unlike hurricanes and other severe weather disasters, which devastate an area and give way to relief efforts, a volcano is an extended emergency as long as it’s erupting. Relief efforts need to begin even as authorities are still in crisis mode. In the case of Kilauea, eruptions are still being reported in the Lower East Rift Zone and the middle part of its fissure system, which is east of the volcano’s main crater. The residential developments of Leilani Estates and Lanipuna Gardens have been hit hard by lava flows and ground cracking, according to the daily updates from the Big Island’s county government. About 50 structures have been destroyed, including two dozen homes. The lava’s encroachment on a geothermal power plant raised additional concerns this week, and authorities are working with the utility to secure the plant’s wells. The lava flow also has crossed Highway 137 on its path to the ocean, cutting off all but one potential ground evacuation route for about 1,000 residents remaining in the Kalapana area, according to the Honolulu Star-Advertiser. The Hawaii Army National Guard said May 23 that it had two military helicopters available to assist with new evacuations if necessary. Those Sikorsky CH-53 Sea Stallions “can basically evacuate a whole subdivision of 500 people within two hours,” said Janet Snyder, the Holy Apostles member who works as spokesperson for Hawaii Island Mayor Harry Kim. The volcano also is spewing ash, sometimes in plumes as high as 8,000 feet, and wind is carrying some of the ash west, affecting communities in the neighboring Kau District. 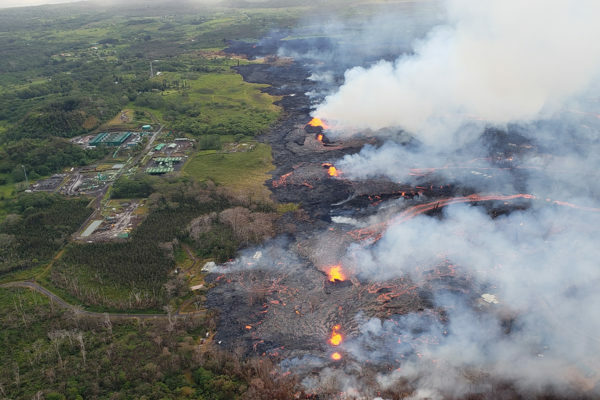 Air quality in the Puna District has worsened because of sulfur dioxide from the eruption. Authorities have been distributing masks this week to shield from the ash, but the masks don’t protect against gases and vapors. That is why air purifiers are needed in the area, especially in schools, McCallister said, and her congregation is working to raise money to help buy the equipment. The church is partnering with other faith groups, government agencies, social service agencies and nonprofit organizations to coordinate local relief efforts. McCallister also has been talking with Episcopal Relief & Development about ways the agency can assist. Holy Apostles created its own Kilauea Relief Fund to collect donations from across the diocese and beyond to pay for a long list of items, including blankets, pillows, clothing, air purifiers and rental assistance. The church offered its parking lot for displaced residents wishing to camp in their cars rather than stay at emergency shelters, though only one family has regularly taken the church up on that offer. Most people are staying with family members or friends, McCallister said. And McCallister has provided pastoral care for members displaced by the volcano. “It’s an emotional situation for people. We’re talking about homes and lives, cultural heritage. Family heritage is a deep, deep part of life here,” she said, and for families who have lived in the same home for generations, it is hard to suddenly leave that behind. Bishop Robert Fitzpatrick pledged the support of the Diocese of Hawaii early on, issuing a statement May 4 to say he was coordinating with Holy Apostles to help those most in need. McCallister’s congregation and its community partners have been deliberate in reaching out to all who need help in this difficult time. As a Parishioner and a member of the Vestry we are in the thick of the relief effort for those whose lives have been uprooted by this disaster. Our Priest Pastor Kaitlin has done a tremendous job raising our consciousness and advocating with the Parish ways we can help. She is a joy and inspiration. Meanwhile the lava keeps flowing,homes and lives are being destroyed. Please consider giving as you are able to the relief efforts going on in the Puna District.